Do you remember your first outreach email pitch? I can still see mine very clearly, spending an hour rewriting the same 12 sentences and not getting a reply. 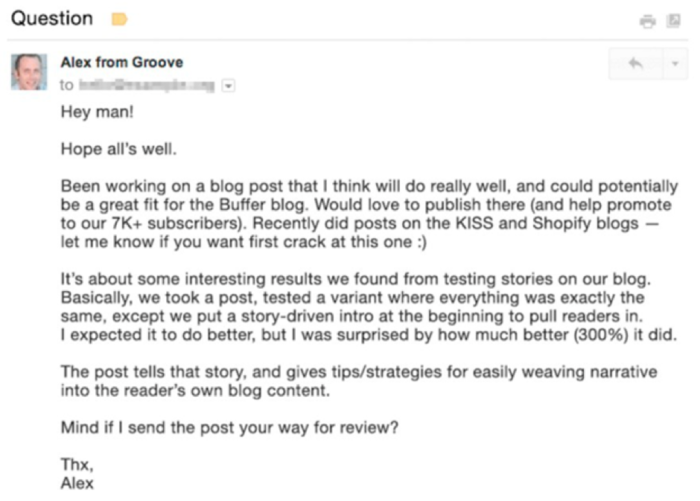 I never got a reply because I send topics that weren’t so relevant to the blog I was pitching to – a fact I was to realize months later. Needless to say, I was gutted when no reply came. And even though the number of emails I send every day is exponentially growing, I can still get that sinking feeling when I come to work to an inbox full of newsletters. Bearing in mind the fact that the average open rate for a cold email wavers around the 20% mark – none of us should be surprised when we get one reply for every ten emails sent. Is there no way to improve these odds, I hear you muttering. The very first thing that can help you increase the chances of your emails being opened is to send them to the proper address. Let’s assume you have already done your prospecting right, and are now simply contacting these same people. Don’t rely just on an automation tool to choose the right email address. Yes, most of them are great and can help speed things up significantly, but they can also often find the most generic of emails. 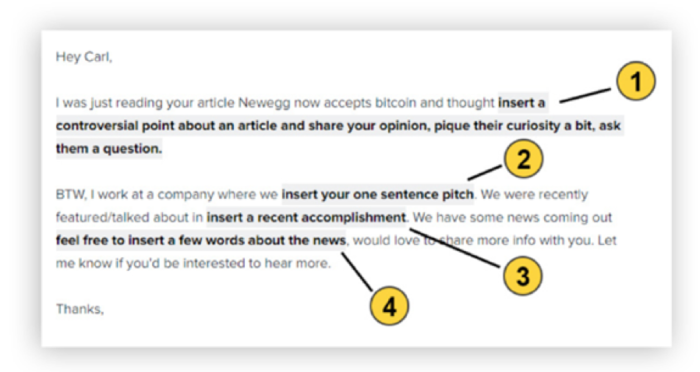 Lots of websites clearly state where to send a pitch – be it an editor or a dedicated content team member in charge of this type of correspondence. And while you may hope that the VP of sales you have accidentally contacted will forward your email to the proper quarters, this will rarely be the case. 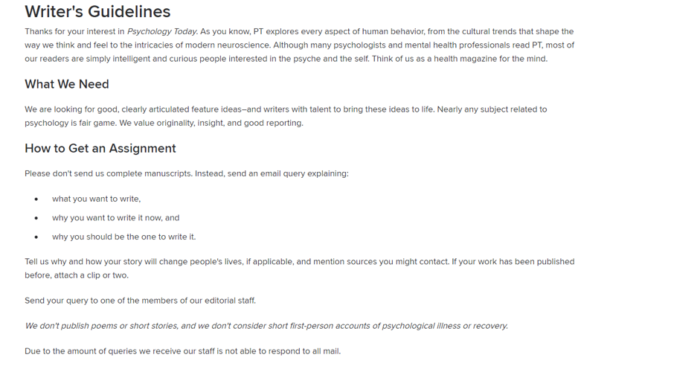 Take the time to read “write for us” pages, contact pages and about pages. See who you need to pitch to, and only then start crafting your email. These pages will tell you everything you need to know to get through to the right person, and not get off on the wrong foot, so to say. Things like word counts, preferred article topics, the email address to send pitches to and any more specific requirements will be clearly stated, and you will know just what you need to accomplish to get published. 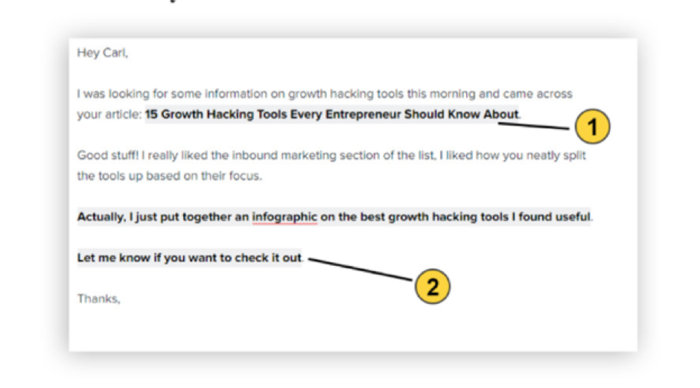 Some websites prefer their subject lines to take on the “how to” form, while others mostly run “X ways to” articles – this info will help you craft a pitch that is more likely to appeal to your target. For example, some websites will require you to add gifs to the post: and this may or may not be your forte. In fact, you may find gifs annoying when reading a post. Others will require you to add in a bunch of screenshots, which again, you may find annoying and time-consuming. Needless to say, you will have to put your own preferences aside and try to appeal to your target and their way of doing things within the pitch itself. Another brief side note before we move on to the pitching part. Before you send your email at 17.30 on a Friday, think about the other person’s inbox. How many emails do you think they get? Are they likely swamped by similar requests every day? Do they also manage a team of people in-house? How can you ensure your message gets across at the right time? Sending emails during the weekend or on holidays is clearly not the best of choices. The best days to send emails are Tuesday through Thursday – and the best times include 10AM, 8PM, 6AM, and 2 PM. Make sure you take the recipient’s time zone into account as well. This does not mean you have to be awake at four in the morning to send out an email. There are a bunch of tools out there that can do this for you, all you have to do is schedule your emails. Now that you have the right time and are contacting the proper person, you need to tackle what is arguably the most critical step in crafting an email pitch: the subject line. Before they ever get to your actual pitch, people will a) choose to ignore your email because it was sent to the wrong person at the wrong time or b) choose to mark it as spam because the subject line you have chosen does not spark their interest one bit. 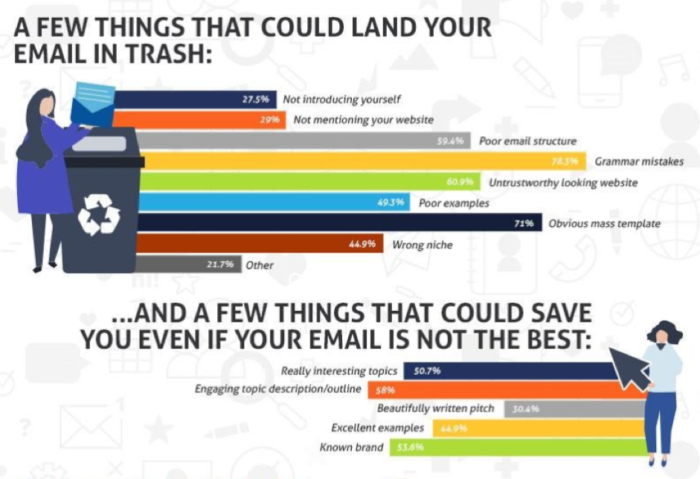 In fact, 35% of recipients base their open/delete decision on subject line alone. 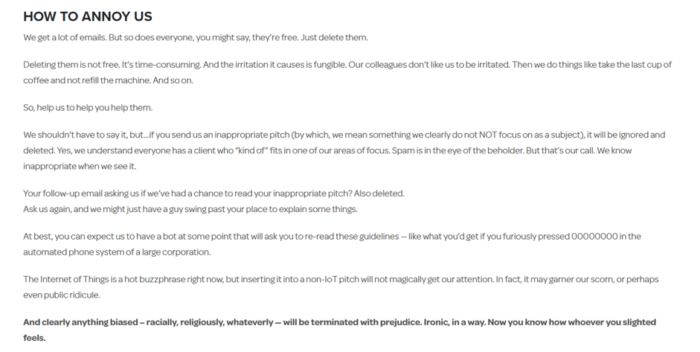 No matter how good your pitch is, if no one reads it, it is of no use to you. However – do bear in mind that these kinds of subject lines can both trigger spam filters AND come off as spammy to the recipients themselves, because this is what most marketers and salespeople use, so choose wisely, and make sure to test and re-test. According to the recently published research on how to write a perfect guest post pitch 54.7% of editors in content saturated niches prefer simple subject lines like “Guest post suggestions”, “Guest contribution” or “Guest post suggestions”. And the main reason is so they immediately know why are you contacting them. So, depending on the goal of your email (promoting a product, pushing a sale, advocating a service, etc. ), you will need to choose something short, to the point, honest and exciting. Sounds like quite a task, doesn’t it? Even though these subject lines might sound boring, they do get very high open rates (at least from my personal experience). In fact, they get better results than the overly hyped up subject lines everyone else keeps talking about as a good choice. After that, run, and A/B test and see which work best for your specific purpose and target list. Don’t expect to find a magic subject line that will open all doors. Now that you have a foot in the door, so to say, the time has come actually to pitch something. One of the blogger outreach lessons you learn early on is that you need to appeal to and connect with the person you are pitching to in some way. Depending on the scale you are doing outreach on, you may want to do one of two things. First: a template will help, no matter how many emails you are sending. By template, I mean a general outline of your pitch: greeting, signature, info about yourself, a general outline of your proposal. If you are using an outreach tool, you can easily save your template, but even if you are doing it manually, you can at least copy-paste it. However, don’t think of your template as a set in stone. If you normally use “Hi PERSON’S NAME” as a greeting, don’t be afraid to change it to “Dear editor” if you feel a more formal approach would work. Now, to the personal stuff. Your template needs to be tailored to every recipient you reach out to. This means proper name, title, and anything else you can find that you feel will boost your chances of getting a reply. Has the blog you are pitching to recently published an interesting article? Mention that. Did they tweet about something you know a bit about? Mention that. Did they decide to adopt the cat in the office to increase workplace productivity and happiness? The trick with personalization is to let your target know that you have taken the time to read their work, and that you are sending this email for a reason, not just because you have scraped Google and their name popped up. You should not stalk their personal Facebook accounts to see where they like to eat and make a reference to that. This is a business email after all, so unless they blog about their cat, don’t mention the cat. Another important point to be made about personalization is that you should not make it sound like a template, and this is where it can get really time-consuming and challenging. What I like to do is modify my template just enough to make it appeal to the person who I am writing to. I will mention something specific about a post they have written, not only its title (because it’s very easy to use a tool to add a post title to an email template). I will mention that I loved their booth at the convention they went to last week. Something like that.To the point, yet not taking too much effort. And I don’t exactly mean flaunting your follower numbers in the actual pitch. There are two ways to use social proof in your pitch to your advantage, one more direct than the other. The first, milder and definitely highly recommended thing to do is add a link to your most used and most relevant social network to your signature. You should also add a headshot, a professional-looking and recent one at that. As for the social links – if you Tweet a lot and your Tweets are work related, and you have a decent amount of followers, you can add your handle to your signature. If you don’t use Twitter for business purposes, you can omit it and use LinkedIn instead. Another good step would be to follow and communicate with your prospect on social before sending your pitch. That way, they can see that you actually do follow their work, and are interested in what they have to say. Just don’t follow the follow up with an email within seconds. As for the second way to utilize social proof: you can choose to mention a recent success you have had with a post, however, to some, this will come off as too pushy and obnoxious, so be careful how you phrase it. For example, if you have had thousands of retweets and hundreds of comments for a post similar to the one you want to pitch, you can mention this fact in the email. Try to make it sound less like tooting your own horn, and more like a benefit to the prospect. You now likely have your prospect’s attention. Don’t mess it all up by being vague about what the purpose of the email is. If you are selling something, do say so. Don’t rub it in the prospects’ noses, but do make it very clear what you are selling, and everything else they might need to know about the product or service. If you want them to share one of your posts, clearly say which post and why it’s useful. If you want to write for their blog, make this very clear. Now, when it comes to this point, there is a lot of talk out there about the importance of giving something back to get something. This is in one way true, but I’m not a very firm believer in the philosophy. What you are mostly doing with your outreach email is trying to build a relationship. If it’s a sales email, you’re clearly offering to provide a service or a product for a certain amount of money. Looking for someone to promote your brand? You will be offering them exposure, or a freebie, or something else. If you want to post on a blog, you are providing content. While this may or may not be clear from the email itself, you don’t need to promote the fact too loudly. If what you have to offer is interesting to the prospect, they will get back to you, and then you can discuss the benefits of the relationship you are embarking on. Finally, the key to the perfect pitch is following up on said perfect pitch. You wouldn’t believe how many people simply forget to reply to an email, because they have just spilled coffee on the desk and need to tackle that. Or have two other more pressing emails and hope to come back to yours but forget. Follow-ups are key in the outreach process. If you are not following up, you might as well not be sending emails out in the first place. As with subject lines, test and find a sequence that works best. Never follow up within 48 hours. Give your prospect time to get back to you. According to the research mentioned above, almost 50% of editor prefer a follow-up email after one week. After your initial follow up, a second one is also in order. A third might be pushing it, depending on the approach you’d like to adopt. I personally use two. The follow up should be just a gentle nudge, asking your prospect if they have had time to read the initial email. No need to repeat yourself, they can read the first one, the one you so carefully crafted. If you don’t get a reply, don’t be too gutted. After all, 20% is the norm. The secret to getting a reply to a cold email, and a positive and interested one at that, is reaching out to the right person, at precisely the right time, with an offer they are particularly interested in. Chances are, this will not always happen, and that is not what you should expect. Aim to offer value to your prospects – after all, you have selected them for a good reason: they want what you’ve got. All that you have to do now is make them aware of this fact as well.